A consultation will be launched today on setting a minimum price per unit of alcohol sold in Northern Ireland. ALCOHOL SOLD IN Northern Ireland is set to be subject to a minimum price per unit under new laws to be announced by health ministers today. The Northern Ireland Department for Social Development will announce minimum price plans for alcohol sold in the North today, reports the BBC. A consultation will be launched on setting the minimum price per unit of alcohol at between 40p and 70p. The North’s health minister Michael McGimpsey said that alcohol misuse was costing the health and social care sector almost £250m a year. McGimpsey said that in real terms alcohol was 62 per cent more affordable now than it was 30 years ago, reports the Belfast Telegraph. He pointed to research which indicated that a minimum price per unit of 40p and a ban on promotions would decrease consumption by 5.4 per cent and cut healthcare costs by £13.5 million per year. In January, a leading alcohol awareness charity called for the government to introduce minimum pricing for alcohol in the Republic. 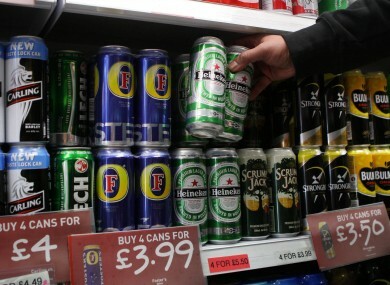 Email “Minimum pricing for alcohol plan to be launched in Northern Ireland ”. Feedback on “Minimum pricing for alcohol plan to be launched in Northern Ireland ”.